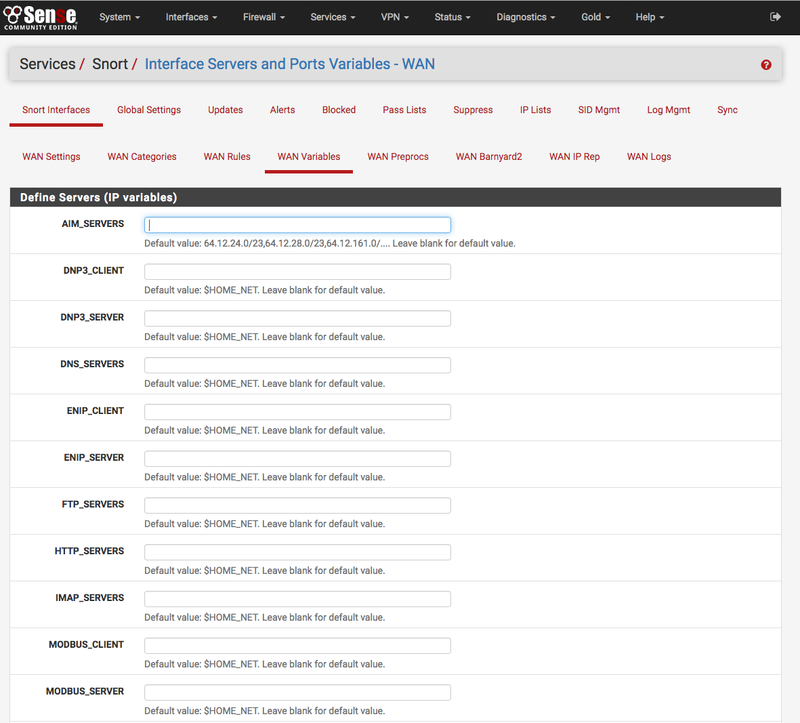 The Variables tab is where the specific types of hosts on the network are configured. For example, the specific IP addresses or network ranges containing web servers to protect may be defined. This can make Snort more efficient because it won’t waste time scanning for web server threats on IP addresses where web servers do not exist. Similarly, Snort performance can be optimized by instructing it which addresses contain other critical servers such as SMTP, POP, DNS, etc. The exact ports or port ranges used for certain services on the network may also be specified. Each value entered on this page can only be an existing Alias. Start typing the name of the Alias into a textbox and a drop-down selection of matching entries will appear for selection. Aliases are created under Firewall > Aliases from the menu.